YCLA Recipient Faith Gealey is actively fulfilling her mission this year to encourage mentorship. 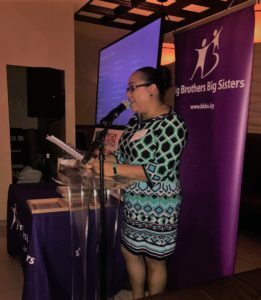 Since receiving her award last November, Faith has presented at more than a dozen engagements and has spoken to approximately 5,000 people in Grand Cayman and Cayman Brac including the Girls Brigade, Big Brother, Big Sister, Cayman First, Youth Flex Radio and schools in Cayman Brac and more. Faith says the past few months have been rewarding. Young and old audiences are clearly inspired by Faith’s message. At the recent Chamber of Commerce Mentoring Luncheon, mentee Jalvado Blake described the speech as inspirational. YCLA celebrates its 18th Anniversary this year on November 3rd, 2018 at the Kimpton SeaFire Resort. This year’s theme for the event is “It Takes a Village.” Through this year’s event, the foundations wishes to identify, celebrate and honor young leaders in our community who are living out a unique part of Cayman’s culture and history where the whole community – neighbors, teachers, family, and friends – take care of one another and intentionally invest in Cayman’s youth and community. Nominations are open until July 1st, 2018 for this year’s recipient. Candidates are nominated each year by members of the public and are open to any Caymanian between the ages of 20 and 35. Nomination forms and more information can be found at http://www.youngcaymanianleaders.ky/nominate-someone/ . The Young Caymanian Leadership Awards program has as its goal to recognize and honor role models for the youth of Cayman. Each year, the recipient commits a significant amount of time and energy to speaking with and encouraging Cayman’s young people to make the right choices in life and achieve their full potential. I am sure you will agree that in today’s world, the positive messages that Faith can impart to our youth are more needed than ever before. The YCLA extends special thanks to its Sponsors. These committed organizations make the program possible. Major sponsors are Dart, KPMG, and PricewaterhouseCoopers; Other loyal sponsors are: Progressive Distributors; Walkers and Celebrations. If you or your company wishes to sponsor the YCLA event this year, please contact Brianna at brianna@ycla.ky .